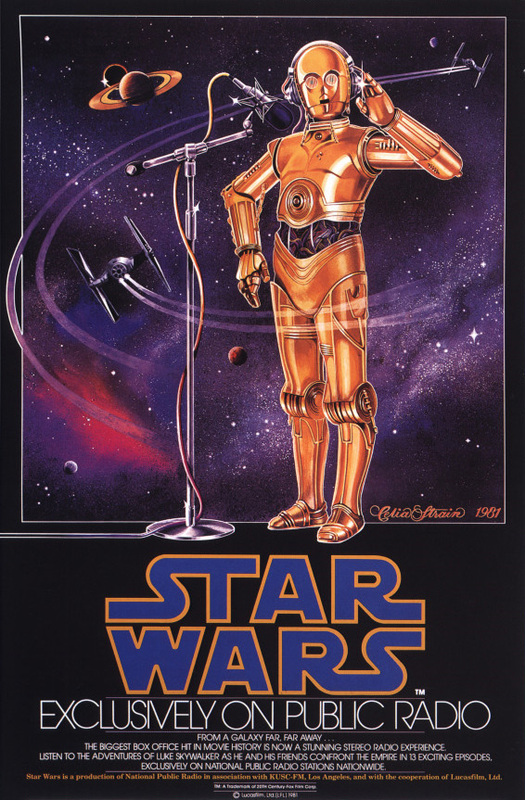 The first Star Wars radio dramatization for A New Hope was produced and broadcasted by NPR Radio back in 1981. In the 13 part episode which reaches nearly six hours in total time, the story is expanded to go more in-depth in the story of Luke on Tatooine, Princess Leia in Alderaan and more. It features great voice actors that really fit the roles well, and even includes a the voice works of Mark Hamill (Luke Skywalker) and Anthony Daniels (C-3PO). It truly sounds amazing with all the sound effects and fantastic music by John Williams. It sounds as if you were listening to the original Star Wars movie, but expands the storyline considerably. NPR radio experienced some of the highest ratings in it’s history with the broadcast of this series. The Empire Strikes Back radio drama was released a few years later in 1983, and both Mark Hamill and Anthony Daniels reprised their roles. Billy Dee Williams also was featured on it with his role as Lando Calrissian, while actor John Lithgow did a great job voicing Yoda in the series. Similar to A New Hope, the store expands over 10 episodes which totals 4 hours and 15 minutes. The Empire Strikes Back radio drama was also produced and broadcasted on NPR radio. It wasn’t until years later in 1996 that the Return of the Jedi episode was released and broadcasted on NPR. Return of the Jedi radio drama was much shorter than the previous two with only six episodes, and actor Anthony Daniels was the only actor to reprise his role from the actual film. It’s still a great series to listen to, and expanded the story. These new included Luke constructing his new lightsaber, and a brief appearance of a new Jabba dancer named Arica who’s true identity is Mara Jade from the Expanded Universe novels by Timothy Zahn. All three series were released on both audio cassette and eventually CD. They are also now available through digital download sites like iTunes. They are definitely worth downloading and listening to them if you haven’t done so already. Be warned that the audio quality isn’t the greatest on iTunes, and the best way to listen to it is through the original CD’s. Nonetheless worth the purchase and time listening through them all. The Star Wars radio drama is the most underrated and overlooked piece of Star Wars out there.